Hydraulic dredging of 2,140,428 CY of sediment contaminated with mercury and other COC’s. Mechanical and hydraulic placement of 2,350,000 CY of multiple capping materials upon completion of dredging. Construction and operation of four 600 HP electric booster pumps through a 20,000 ft pipeline. Installation and maintenance of 20,000 lf of double wall 18 inch HDPE pipeline. Development of custom built and automated granular activated carbon (GAC) system used in a hydraulic capping system. The GAC is mixed with sand and pumped 5,000 ft to an automated capping barge for even distribution on the lake bottom. Participated in constructability review with the design engineer to finalize plans and specifications. Installation of 1,600 lf of sheet pile wall in sediment with low shear stress. 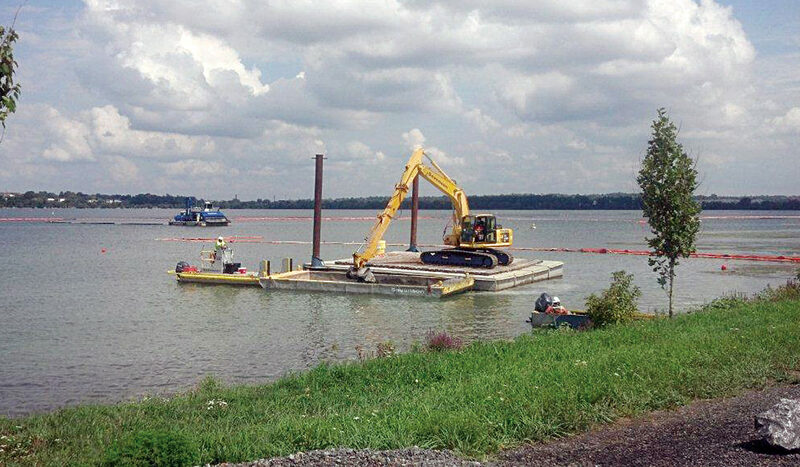 Onondaga Lake Superfund Site is one of the largest environmental remediation projects undertaken in USEPA Region 2. Onondaga Lake is a 4.5 square mile lake located in the City of Syracuse, and the Towns of Salina, Geddes, and Camillus, New York. The lake drains approximately 285 square mile of the surrounding areas. Because of extensive pollution, the lake was officially listed in the NPL December 1994. The Onondaga Lake Superfund Site consists of the lake itself, several tributaries, and several upland subsites. The lake flows into the Seneca River, then into the Oswego River and Ultimately into Lake Ontario. The availability of salt and limestone along Onondaga Lake led to the Solvay Process Company to locate along the west side of the lake in the late 19th century. In 1946, Allied Chemical initiated a mercury cell process which resulted in the discharge of waste streams containing mercury and heavy metals. There are additional sources of contamination to the lake including discharge from municipal waste water treatment plant. As a result, surface water and sediments are contaminated. Ground water at many of the upland subsites is also contaminated. The site is being addressed through federal, state, and PRP actions. New York State is the lead agency on this cleanup. Between 1998 and March 2010, eight Records of Decision (RODs have been signed for cleanup plans at the various subsites. 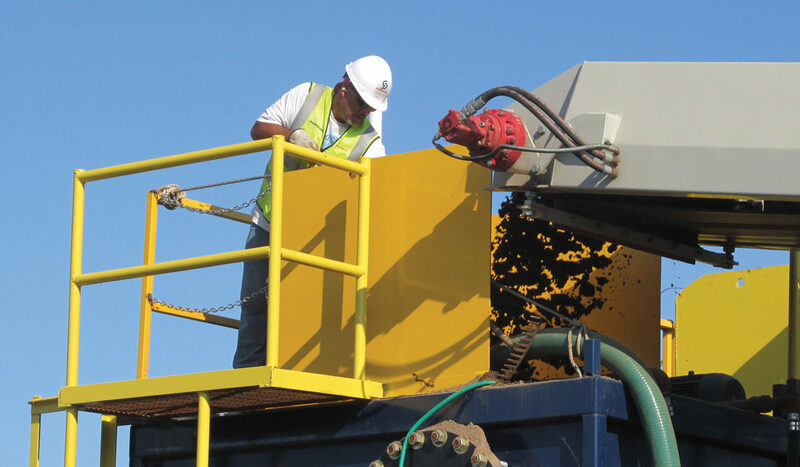 Selected remedies for contamination at the subsites include: dredging of sediments; excavation of soils; on and offsite treatment of contaminated materials; collection and treatment of contaminated groundwater; and capping of excavated soils and sediments. 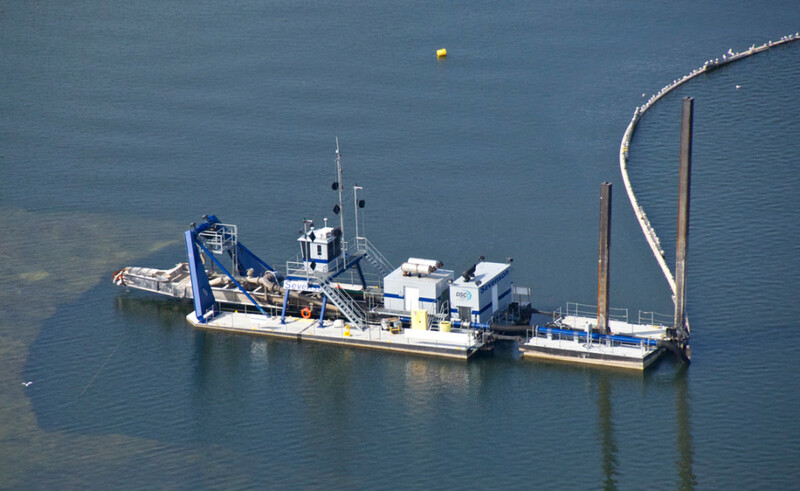 Project required Sevenson to provide design support to develop a sediment dredging, capping, and transport system. Capping extends over approximately 400 acres. 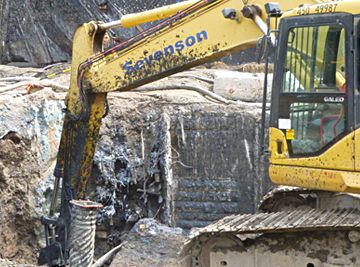 Approximately 2.1 million CY of material was removed using three hydraulic dredges. 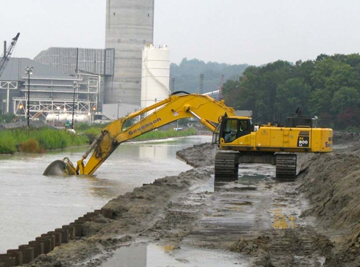 Upon completion of dredging operations, Sevenson initiated backfilling and capping operations. In 2008 Sevenson was invited by Parsons to join a team of technical experts from dozens of scientific and engineering disciplines to address remediation and restoration of lake sediments following established state and federal guidelines. 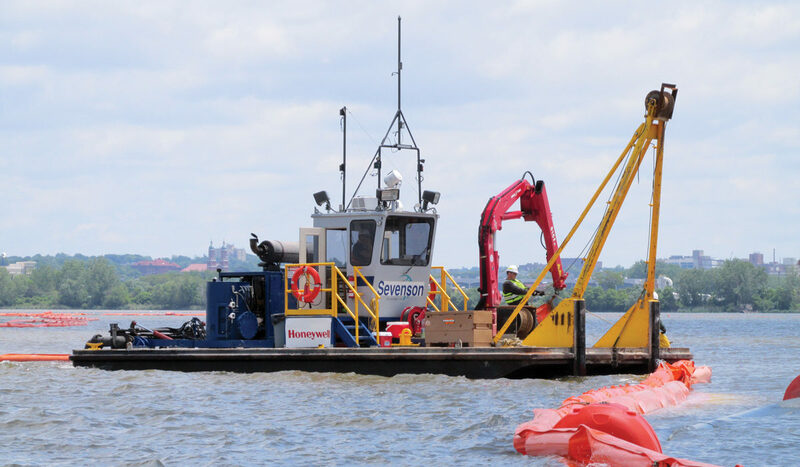 Sevenson’s participated over a 2 year period in project planning discussions focused on constructability review issues surrounding dredging and capping methodology as well as pilot studies and field demonstrations. 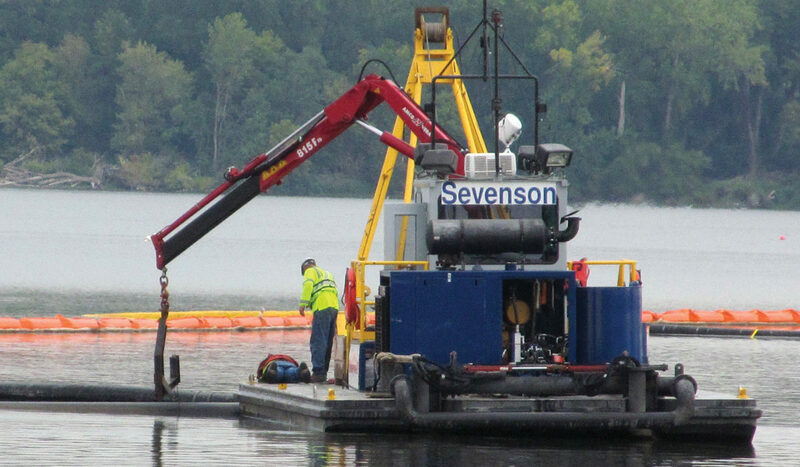 Sevenson’s initial contract required the installation of approximately 20,000 lf of doubled-walled HDPE slurry pipeline, and supporting infrastructure to transport sediment slurry from the lake to the sediment processing area. Upon completion of the slurry pipeline Sevenson was contracted to extend the west wall of the Wastebed “B” / Harbor Brook steel sheet pile wall by installing additional 1,600 lf of sheet piling. A collection system, complete with pipes, valves, vaults, mechanicals, and electrical components was also installed. An additional scope of work item required Sevenson to bypass and relocate Harbor Brook. Site work continued with the installation of a steel sheet pile tie-back system to support an existing sheet pile wall. 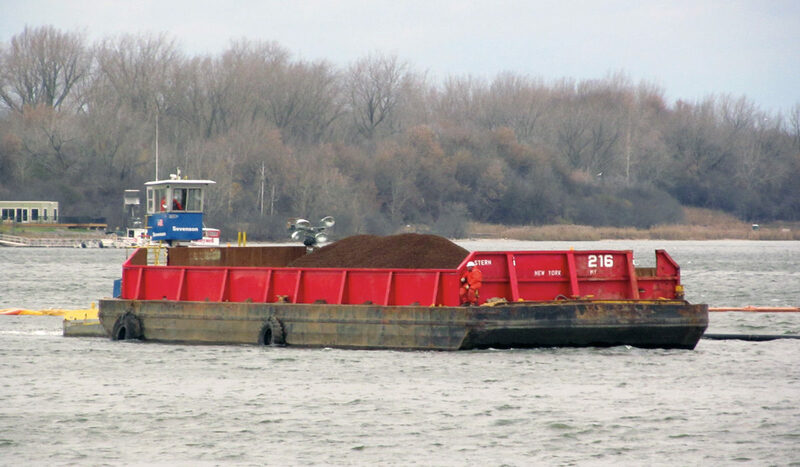 The contract also required Sevenson to construct a concrete platform supported with wood piles over a portion of the bulkhead to ease construction equipment and barge loading and offloading activities. In addition, a timber fender system was installed along the existing sheet pile bulkhead. The purpose of the demonstration project was to evaluate the ability to effectively place sand and GAC through the water column, resulting in a chemical isolation layer with GAC distributed throughout the layer. This demonstration was undertaken to support ongoing cap design efforts. 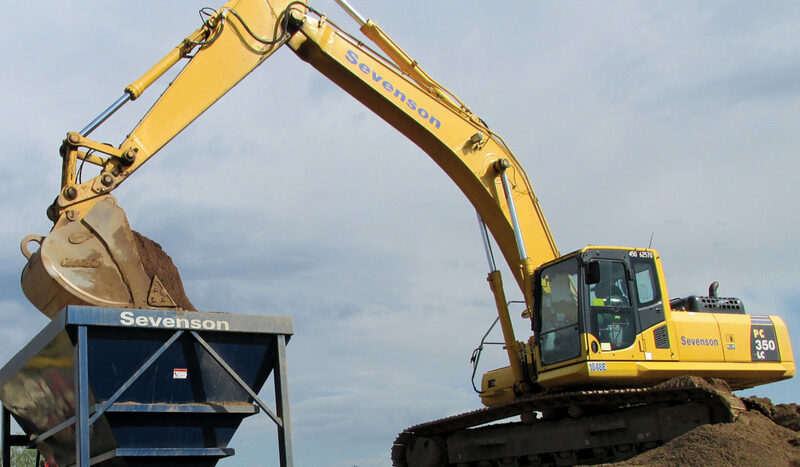 Sevenson used its custom-built slurry system for hydraulic placement of the sand cap and armor stone less than 2 inches in diameter in designated areas. The system consisted of a feed hopper, oversized screening, and slurry system that pumps the sand and small stone hydraulically through a pipeline for placement through a diffuser system. The pump used to convey the sand slurry was a booster pump commonly found on dredging projects. The hopper, screening, and slurry system were situated on the shoreline at two potential locations to minimize pumping distances and the need for booster pumps floating on the water. Sevenson placed over 2.35 million CY of sand and rock to form a multilayered cap. Sevenson also placed larger stone materials mechanically and in locations where the spreader system could not reach. 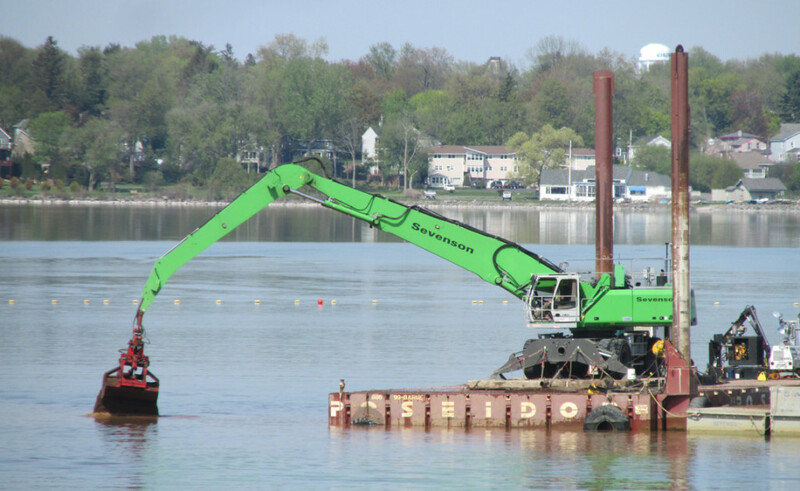 Sevenson utilized three dredges to remove sediments. 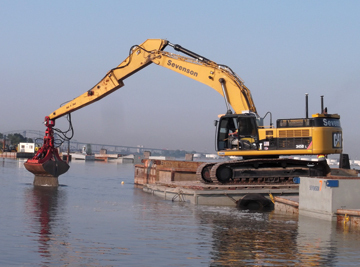 Two of the dredges performed the majority of the dredging. They were equipped with 16 inch and 14 inch discharges with over 1,000 HP installed for pumping. 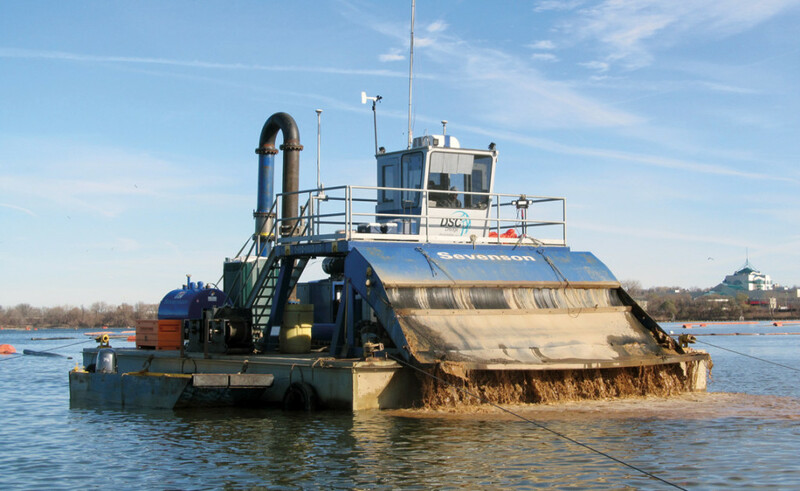 The third dredge (8 inch) was available for dredging in shallow water or confined areas. Sevenson‘s two production dredges were each capable of handling the required daily production of 4,500 CY per day. 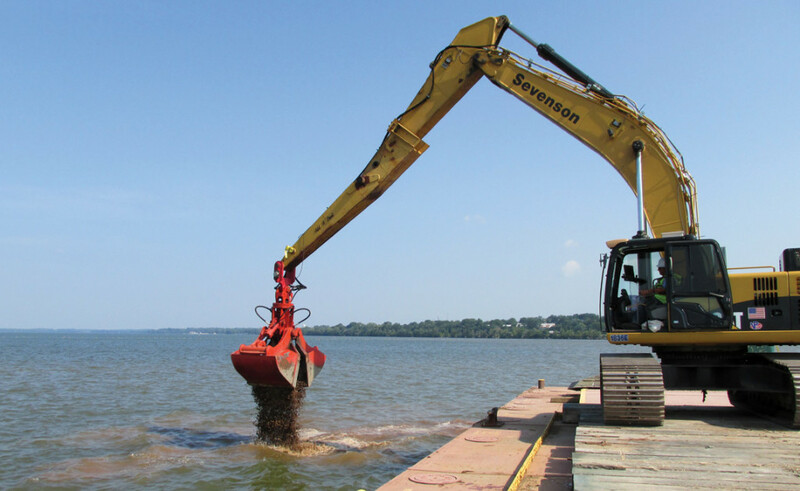 These dredges were selected to maximize dredge production and efficiency for the variable site conditions.